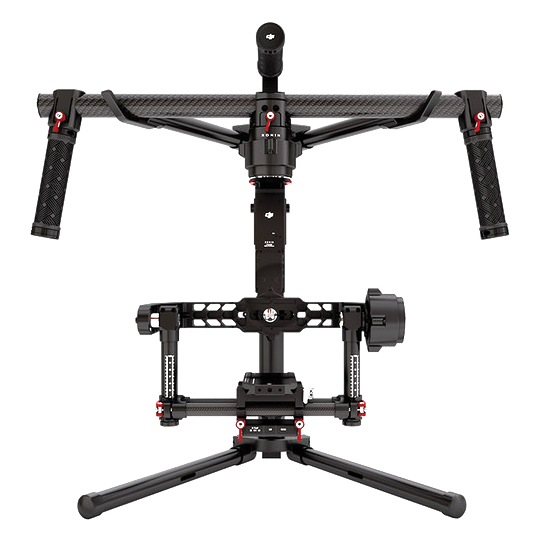 The Ronin 3-Axis Brushless Gimbal Stabilizer from DJI is a camera stabilization system designed to give the operator the freedom of nearly unencumbered handheld shooting without the shake. Suitable for most camera types and configurations up to 16 pounds, Ronin uses brushless motors that work on three axes: one for side-to-side "roll" - keeping the horizon level - one for tilt, and one for pan. The system is computer-controlled and boasts a precision of control of ±0.02°. An IMU (inertial measurement movement) detects movement and engages the motors to react, using algorithms to differentiate between intentional movement such as pans and tracking shots from unwanted shake. In addition to handheld shooting, the gimbal can be used in vehicle mounting scenarios and other contexts where vibrations or other abrupt movements would make tripods and rigid camera support systems unsuitable.